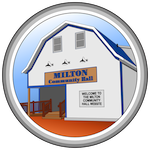 Hall Annual Meeting - Monday, January 28, 7:30 p.m.
January means it is a new business year for the Milton Community Hall.... so it is time to review 2018 - which was the year the debt was paid! Please come out to the Annual Meeting on Monday, January 28 2019, at 7:30 p.m. at the hall. Elections will also be held for the hall board members. If you are interested in being part of this successful community organization, please attend, or send us a note! Adult residents of Miltonvale Park are members of the Milton Community Hall, Inc. The storm date is Tuesday, January 29 at 7:30 p.m.